Seriously…do we even have heartworm in Ontario? Unfortunately, we do. There are several hundred cases in Canada each year, with the bulk of them (about 70-75%) being in Ontario – that means over 150 cases within 100 miles of Clappison Animal Hospital were reported in 2014. Don’t forget, these are only the cases that have been officially reported…the actual number will be higher still. Heartworm is a parasitic worm that travels in the bloodstream and then resides in the heart. What are the risks of heartworm disease? The infection can result in damage to the heart and lungs. It can be a potentially fatal condition. Mosquitos do that. But not all mosquitos automatically carry the parasite. They have to acquire it from a domestic dog (or wildlife such as foxes and coyotes), after which they can pass it along when they go to their next victim for a blood meal. Whoa! Does that mean that people can catch it? Nope. 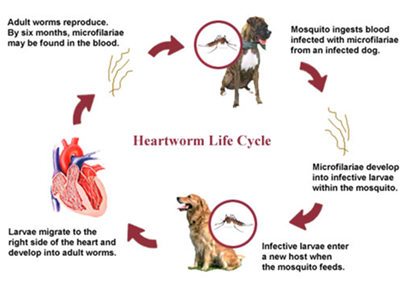 If a heartworm-infected mosquito bites a person, the parasite will be unable to complete its’ life cycle to the adult stage. Cats can become accidentally infected with the heartworm parasite, and it can complete its’ life cycle to the adult stage, but cats seem much more resistant to the long term health effects than dogs. In Ontario, it is uncommon (but not impossible) for the adult heartworm parasite to cause disease in cats. The risk increases significantly if a cat has come from areas of high heartworm prevalence in Ontario or the southern US. Ask a staff member if prevention would be appropriate for your cat’s lifestyle. Why is the medication we give for heartworm called a preventative? Because unlike most other deworming medications that people give to their pets to rid them of an adult parasite, heartworm preventatives are killing the immature form of the parasite, preventing them from developing into the most damaging adult form of the disease (infesting the large blood vessels of the lungs and even occupying the chambers of the heart). I have heard from people at the dog park and on the internet that it is not necessary to give the medication every summer. They said to just give my dog that monthly drug only if it gets the disease. It is definitely not that simple. There is a great deal of misinformation out there regarding heartworm medications. The medication that is used to kill the immature form of the parasite is different than the medication used to kill adult heartworm. In addition, treatment of adult heartworm disease can be a risky and expensive undertaking. Don’t forget, these large worms live in vital parts of the circulatory system. When they die, they can lodge in blood vessels and create a significant inflammatory response. Why do I have to test my dog for heartworm before giving the medication? In some cases, the (preventative) medication can kill the early larval form (the 1st stage larva that is released in massive numbers by adult heartworms in the blood vessels) so rapidly that a severe inflammatory response can occur. This can make your dog unexpectedly very sick. It is a safety issue. I have given the medication year after year, so why do I have to keep testing? If an appropriate preventative has been given during the appropriate months, the risk of developing adult heartworm disease in Ontario is very low. But we humans get busy and forget to give a couple of the doses, or don’t come in to pick up the medication until half way through the summer, etc. As soon as the season is not covered properly, the risk of disease has occurred and we suggest re-testing to make sure it is safe to start the current year of prevention. Even if you have given the medication perfectly every year, it is good to periodically test, in order to make sure it has been effective. My dog has tested positive, now what happens? The first thing we do is re-test in a few weeks to confirm that the dog is positive or not. If a positive is confirmed, then we will often take x-rays of the chest to see if there are obvious changes in the shape of the heart. Based on the information from the testing, a treatment plan will be decided upon, which may involve a series of injections and strict rest for several months. What is the best heartworm preventative medication to give? I have a young dog, and I have heard from other people that they don’t need heartworm prevention their first summer. This is a common and unfortunate misconception. The risk for dogs contracting the parasite during our summer months is the same regardless of age. The confusion likely arises from the heartworm blood test. If a pup was born in Ontario after about mid-October, then the risk of them catching the parasite at the end of that transmission period is practically zero. These dogs, therefore, would not require a heartworm blood test before safely starting the heartworm meds the following June. This will be different for imported dogs born in more southern climates, where the heartworm season is longer. Why am I waiting until June to give the first heartworm dose and my last dose in early November…it seems so late ! That’s because heartworm medications purge your animal of larvae that have been transmitted to your dog in the previous 30 days (i.e. May is covered by the June 1st dose and October by the Nov 1st dose). I am going south in the winter with my dog, what do I need to do ? You will likely need coverage for heartworm for your dog while you are away. Talk to your veterinarian before travelling with your pets, in order to determine the duration of coverage needed. Heartworm is an incredibly easy disease to prevent in Ontario, by giving an effective medication for the required duration, each summer. It can be a difficult, dangerous and expensive to treat if the adult form of the disease develops.